This week on Marvel’s Pull List, Ryan Penagos, a.k.a. Agent M, and Tucker Markus break down some big brawls spilling across the pages of three exciting books: INFINITY WARS #4, IMMORTAL HULK #7, and AVENGERS #9! 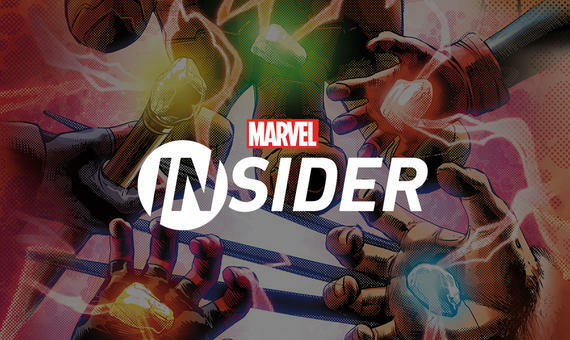 Get a look inside this week's new Marvel Comics! Marvel's Pull List presents a special preview of the new books on the way from the House of Ideas! In this special edition of The Pull List, Ryan and tucker reveal all of July's upcoming comics including Jonathan Hickman's X-Men series, Punisher Kill Krew, Loki's new solo series, and more! Our heroes are on their way through difficult journeys as we talk the four new Marvel comics featured on this week’s Marvel’s Pull List! They break down MAJOR X #1, AMAZING SPIDER-MAN #18.HU, MARVEL TEAM-UP #1, and THE WAR OF THE REALMS #1! The heat is on as we talk the four new Marvel comics featured on this Pull List! Ryan, and Tucker break down AMAZING SPIDER-MAN #18, DAREDEVIL #3, FANTASTIC FOUR #8 & STAR WARS: VADER - DARK VISIONS #2! Celebrate Marvel’s 80th Anniversary with the Pull List as we take you back to the super sixities with books from 1960’s! Ryan and Tucker break down AMAZING FANTASY #15, AVENGERS #4, TALES OF SUSPENSE #39 and TALES TO ASTONISH #44! It’s time for sneaky sneaky action as we talk the four new Marvel comics featured on this week’s Marvel’s Pull List. Ryan and Tucker break down CAPTAIN MARVEL #3, AVENGERS: NO ROAD HOME #6, MILES MORALES SPIDER-MAN #4 and MEET THE SKRULLS #2! All the family issues as we talk the four new Marvel comics featured on this week’s Marvel’s Pull List! Hosts Ryan, a.k.a. Agent M, and Tucker break down TONY STARK: IRON MAN #9, MS. MARVEL #1, RUNAWAYS #19 and AGE OF CONAN: BÉLIT #1! It’s time for painful reunions with four new Marvel comics featured on this week’s Marvel’s Pull List! Ryan and Rickey Purdin break down IMMORTAL HULK #14, KILLMONGER #5, COSMIC GHOST RIDER DESTROYS MARVEL HISTORY #1 and ZIGGY PIG SILLY SEAL #1! Colorist Matt Wilson chats about four of his favorite colored Marvel comics, Including LOKI #1, THOR #1 and UNCANNY X-FORCE #1! All available in Marvel Unlimited, and don’t miss THE WAR OF THE REALMS on sale April 3, 2019! It’s time for slobberknockers and throwdowns as we talk the four new Marvel comics featured on this week’s Marvel’s Pull List! Ryan and Tucker break down BLACK PANTHER VS DEADPOOL #5, SUPERIOR SPIDER-MAN #2, WEST COAST AVENGERS #8 and X-FORCE #3! Celebrate Marvel’s 80th Anniversary with the Pull List as we take you back to the beginning with books from 1950’s! In this episode, hosts Ryan, and Tucker break down JOURNEY INTO MYSTERY #1, MARVEL BOY #1, STRANGE TALES #28 and YOUNG MEN #24! In this episode, hosts Ryan Penagos, a.k.a. Agent M, and Tucker Markus break down DAREDEVIL #1, AVENGERS #14, OLD MAN QUILL #1 and UNCANNY X-MEN #11! Worlds beyond as we talk the four new Marvel comics featured on this week’s Marvel’s Pull List! In this episode, Ryan, a.k.a. Agent M, and Tucker break JOURNEY INTO UNKNOWN WORLDS #1, AGE OF X-MAN ALPHA #1, MARVELS KNIGHT #6 and EXILES #12! Classic stories told in a new way as we talk the four new Marvel comics featured on this week’s Marvel’s Pull List! Ryan and Tucker break down AVENGERS #13, GUARDIANS OF THE GALAXY #1, WAR IS HELL #1, and CRYPT OF SHADOWS #1! Fantastic Four editor Tom Brevoort joins Ryan Penagos, a.k.a. Agent M, for a special Fantastic Four: World’s Greatest Week-edition of Marvel’s Pull List: Mailbag edition, sponsored by Marvel Contest of Champions. Teamwork makes the dream work! Ryan and Tucker discuss four new Marvel comics that feature heroes reaching out for a helping hand: AVENGERS #12, CAPTAIN MARVEL #1, FRIENDLY NEIGHBORHOODSPIDER-MAN #1, and SPIDER-GWEN: GHOST-SPIDER #4.